Thinking about it, it's a wonder I'm on here at all! So, after not-so-lengthy reflection, I would say Brickset is infinitely better. I'm not the only one here then! :-) Me and my parents are the only ones in my entire huge family that has Internet access that doesn't use Facebook or Twitter - and I'm only 20 years old! I do like my phone, but not as much as most, like @TheOneVeyronian above it is only for making calls (and texting sometimes) though. @CapnRex101 Well done on the exams. Now put down the bricks and review pen to get yourself into a stupid state with your mates as is the done thing. Thinking about it, I thought I was strange because I'm not on Facebook (but feels like everyone else on my Geology course at university is, some even use it during lectures! Gosh how many times I've been asked 'Am I on Facebook' by my mates and me constantly saying 'No' was getting quite annoying :-D ). Nice to know I'm not strange, in that respect anyhow. I want to know how you get all this lego. I was always broke as a teenager! CONGRATS! There are countless ways to celebrate your success...that are easier on your liver! During uni, I enjoyed a double feature with friends at the bargain theatre or going on a hike with them in nearby forest. Ditto! Thanks for this thread! Facebook does get tiring, and brickset is much more engaging. Actual face to face time ...as in talking with live friends...is also good for ones soul. One of the major downsides of cell phone usage (besides mowing down innocent pedestrians while driving out of control) is that the poor bystanders have to listen to others gab. Lord help me to not choke each and everyone of those loudmouths! @CapnRex101 Interesting set of subjects. Very different to the subjects I did at A-Level I admit :-) (in case you're wondering, I did Biology, Chemistry and Physics at A-Level :-) ) That feels like an age ago, I can't remember what I did to celebrate. Brickset and Facebook can't even be compared. A friend of mine told me that I gotta be careful with FB because it is very addictive. I'm familiar with FB, and have an account, but I find it incredibly shallow and boring. Brickset on the other hand is a whole different matter entirely; great people, intelligent and interesting discussions, relevant and fresh updates... if I miss Brickset for a day I feel withdrawal symptoms. Like a few others here Brickset is the only social network I use. ( unless you include a few emails, but that is strictly business right @CapnRex101? ;-) ) I'm 16 and I don't have a phone! I've had some pleasant conversations with some of the members and have gotten to know them a little, there is definitely some awesome people here! As long as we have Brickset we need nothing else! *splutter COUGH, hack Grrarrrgh! * (swallowed a bug). My problem with FB is that it's TOO for people to contact you, LOL... "where are the pics from last night?" Heaven forbid if I don't post every moment of my life on the blasted thing... plus my boyfriend is also a non-Facebook user, so he makes me do all the... "Hey, when is so and so's birthday again?" I find Brickset much more relaxing. brickset is great because its full of people who genuinely have something in common. It's a very friendly and tight knit community but I do often wish I could hear more about peoples lives outside of lego, to hear more about who they are, because it can get a it one dimensional otherwise. The best solution, I reckon, is to have Lego mates on facebook as well, then you know where to go to see funny photos of their pets, drunk down the pub etc. When you tire of that after about 20 seconds its nice to come back to brickset and settle into some really interesting discussions. I have been working since I was 10 years old. I always had a lot of money for Lego through my teenage years. Anyway, I use facebook and twitter only for my business and but reading and seeing half the stuff on those sites, it is just stupid(sorry to those I may have offended). Brickset is much more real. We all have a common interest in Lego, we have serious conversations (most of the times), and all in all everyone here is great. When you are on the Brickset forum, you feel like you are with family. So I guess by default it is Brickset. I just hear too many stories about Facebook. How companies are data mining it, (yeah yeah companies data mine everything, but why would I willingly and openly want to contribute to it?) How employers look at it, and how people really put a lot of stuff in there that they probably would not want to put out to the public about you especially. Plus I think the benefits (such as finding and catching up with old friends and family) is outweighed by the negatives (some people I REALLY do not want to catch up with to be honest, and the above reasons). Thanks to all of you for your input on this subject. I so enjoyed reading your comments and once again finding how much we have in common. Sorry it's taken so long to get back in the discussion. I work as an elementary school counselor and we just finished up our first week of school. Very long work days and my evening stalk of the Walmart clearance isle on my never ending quest for anything Lego has kept me very busy. My school is unique in that we are in a very low income area and we have our district autism program. Lego bricks and other element are excellent manipulatives for teaching and learning math, science, language and social skills. My dream is to equip every classroom with an abundance of Lego for work and for play. Sorry to get off topic but I know my Brickset community understands my passion for Lego. Most of my facebook friends just don't get it. I completely agree with 91stlegotreeper, when you are on the Brickset forum, you feel like you are with family. 1) How they know what their spouse is up to thru facebook. 2) How they don't wish anyone on their Birthdays in person, even if they meet them. 3) They are so busy yet they seem to have hours to spend on Fb. @EKSam Thank you, I fully expect it to. I am on Facebook. I have 2 businesses and it really helps bring in business. @EKSam I'm glad to hear that you are NOT anti-social. I'm not either but I do appreciate sharing information with those of my choosing rather than the entire world. I saw this thread come up a week ago and avoided it because of the Facebook title. Now that I have read it I'm kind of glad I did. I thought I was the only one who didn't have a cell phone and don't even know what Twitter really is at all. I do have a FB account but that's only so I could keep tabs on a friend of mine who hiked the Appalachian Trail. Yes, I do much prefer Brickset to FB, much more interesting people here and I couldn't care less what people had for breakfast. You see, I'm much more entertaining than that. I never post food pics, but I do post a ton of Lego pics. Count me in as another person who's not on Facebook or Twitter. Brickset is the first online forum I have belonged to and I feel so at home here, I have made so many truly great friends. I also don't like going anywhere else for my Lego fix! Suffice to say, I will never ever join something like Facebook, it would be all too easy for the kids who used to give me a hard time at school to find me on Facebook and give me a hard time there. Why? Well, that will be kept a secret for now so please don't ask, but I'm sure the reason will be familiar to some of you. I think that's my main reason for not being on Facebook. But anyway, I've never met someone on Brickset that hasn't liked me, it's the only social network that I feel truly welcomed into. I love it how one minute we're talking about best places for cheap Lego, the next we're discussing future releases. That's the beauty of Brickset. Even criticisms (if there are any!) are friendly here. On another note, funny how the Facebook and Twitter symbols on the forum (those that appear along with the likes button) haven't been brought up. Does anybody actually use those? Facebook is and has always been more popular with the older set, like me (I'm 47). We all reconnected with friends from elementary, high school, college that we hadn't heard from in years. It would be really hard to give that up now. One really nice thing about Facebook is that when disaster strikes you can quickly notify all your friends and loved ones that you are ok. Very helpful with all the crazy weather events, tornadoes, storms, plane crashes etc..
Just for clarification, I am in no way suggesting that anyone join or give up Facebook. With over a BILLION active monthly users, fb clearly plays a role in todays society. I too have reconnected with many long lost friends through fb. 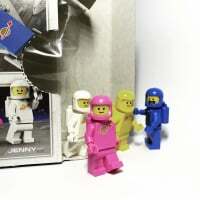 There are also a few nice Lego groups on fb. My original point was nothing but pure appreciation of brickset.com for the opportunity for social connection with people around the world who "get" why I have a room in my house referred to as "The Lego Room" and why the term "LEGOing" is used as a verb at my house. I turned 50 on my last birthday and live in a relatively small community in New Mexico. Since I work at an elementary school I get to share conversations with children about Lego and building and everything else one can imagine (even some things unimaginable). For me, the brickset forum is a treasured opportunity to learn from, laugh with, share great finds with, help ID parts with and occasionally rant with other Adult Fans of Lego. I think in the ordinary run of things Facebook would be quite pointless, however, I just graduated from school and moved from Cameroon to England recently, so I honestly do use Facebook to keep up with schoolfriends who are now in America, Korea, Canada, etc, etc. I think I would also see it as pointless if I could actually meet up with all my friends in person anyway. That said, the Brickset community is awesome, and the sheer amount of collected knowledge is staggering - and not only that, but the knowledge is passed on in good spirits and often with a great sense of humour. As for Twitter - I never understood it when it was launched, and still haven't completely got my head around it now! Facebook, Twitter et al are all just means to an end. I use them to be in touch with widely scattered family and friends across the UK and abroad. It's cheaper than phonecalls and texts and allows me to indulge in certain passions that cannot be broadcast on forums such as these (other toy collections). It's just a personal choice to use them however you decide I suppose and luckily you can choose who, how and what these social sites reveal to you or about you. I do have a facebook account, I tell myself it is so I can keep in touch with a family member who I would otherwise not be able to. The reality is she cannot even be bothered to say happy birthday back to me, so yeah, that's working out really well for me. Lol. A very good friend of mine has a facebook selling group which he asked me to help admin, and my goodess does it make me wish I did not have a facebook account! The easy answer would be to give it up but I don't want to upset my friend or let her down so I spend as little time as possible on there and then come here to unwind. My children get a little confused as to why I say I am going to visit my place of peace but then do not move lol, but here really is the place I very often feel most at peace and very relaxed. I am lucky that my husband is also an AFOL so that makes my life easier and much more enjoyable but sometimes he isn't in the mood to talk LEGO or is planning his work schedule for the following day so I pop on here and instantly feel at home. My 2 very good friends are not AFOLs but they love that I am, and they understand it in as far as they have the same passion for collecting something and they do what they can to support me, like sending a photo of the underground map from London whilst on a day trip, and the other is currently picking up the mail polys for me and the boys as she lives close to smiths and knows I cannot get in to get them. Others of my 'friends' who have now left my facebook page have been funny about our collecting and one really judgemental, I don't get any of that here and I love it. Sometimes I come here and think of it as the library, I just sit and read and enjoy, other times I come and read and add my own contribution and either of those things is fine. There is never pressure to say something for the sake of it, or to keep quiet when I really want to say something. I am not judged here, nor treated as inferior and I have encountered some truly lovely people here and some wonderful acts of kindness (@carlq I am looking at you here) and have been able to try and pay it forward by sending others things that they needed, for no other reason than because they needed it. As far as I am concerned Brickset rocks and there is no place I would rather be and no place I would be accepted so much.